Once that’s done, we’ll move onto our next One-Season Wonder, which will begin in late May. I have that show already picked out too. It needs no introduction – it’s Joss Whedon’s Firefly. That will take us into mid-August, and after that, there are many different directions we could go with the feature, but I have a number of other classics, some I’ve seen and some I haven’t, on my shortlist. And you can fully expect me to break the One-Season rule by this time next year, because there are plenty of two-season wonders out there too, or multi-season shows that had one wondrous season. I’ll make it work somehow. 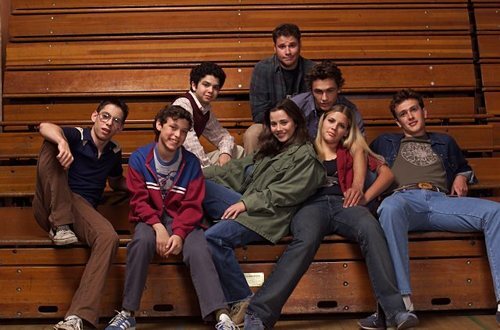 Anyway, I’m very excited to share my thoughts on Freaks and Geeks with you. Looking at the first few reviews I’ve completed, I think it’s some of the best writing I’ve ever done, because few shows have ever given me this much to discuss. As with all my TV reviews, it’s expected that the reader has seen the episode, just as a literary analysis would delve into the book without summarizing every salient plot point. If you haven’t seen the show, the episodes are easy to find on DVD, though they aren’t available for online purchase; if you see the show in the future, these reviews will be here waiting for you when you’ve caught up! The fun begins this Wednesday, and it should keep some interesting content coming mid-week year-round, even during dry patches at the Cineplex. Enjoy!